Sarkhan, Fireblood is an exciting new Planeswalker from M19. Check out its new Dragon-centric synergies and card advantage options in this week's cast! Doesn't Resplendent Angel Just Get Killed by Abrade? But with only three toughness, it is vulnerable to multiple cards in the most popular current Strategy... Not just Abrade but Lightning Strike will eliminate this creature. While the Angel has the ability to buff itself offensively and gain lifelink... That doesn't cure three toughness versus instant speed removal. The same Abrades, the same Lightning Strikes, will be able to shoot it out of the sky in response. They can't always get her, can they? And anyway, when she's good, she's got to be really good. It is certainly a payoff... But there is no reason to think so narrowly. Tons more M19 in this podcast, including scads more flyers; from Nicol Bolas to his fellow Elder Dragon Legends. Many of them look equally fantastic. Learn more in the cast. Wizards sent us Liliana's Contract to reveal to you! Effect of card: When Liliana's Contract enters the battlefield, you draw four cards and you lose 4 life. At the beginning of your upkeep, if you control four or more Demons with different names, you win the game. So... Who's in it for drawing four cards? At five mana for four cards, Liliana's Contract is priced similarly to Tidings. In its day, Tidings was a Standard Staple in Vore decks to a variety of control decks. 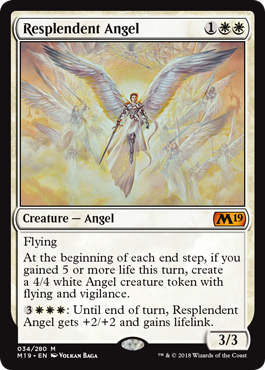 While the four life is potentially prohibitive (versus, you know, losing zero life) it's important to note people are paying four mana and two life to draw cards in black right this format. For one more mana, Lilian's Contract represents a powerful upside. Its being an enchantment is quite interesting; you can draw four into your Demons, it can sit around waiting for a win, or you can play it after you've already got your Demons. Lilian's Contract is powerful and flexible. It can probably fuel a black control deck that happens to play Demons... Or you can play a dedicated Demon-combo deck. There are multiple playable Demons in Standard. Ammit Eternal has already proved Top 8-capable; while Demonlord Belzenlok is the "big bad" of Dominaria. Lilian's Contract might be great randomly alongside a handful of already-good-enough Demons. With Arcane Adaptation in play, it will be much easier to produce four differently-named Demons. 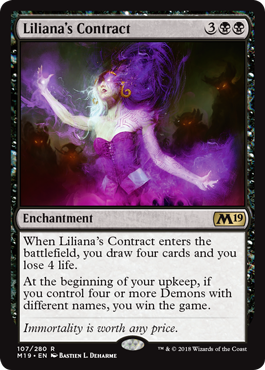 Every token, every random body, will get you that much closer to winning immediately with Liliana's Contract. We're already seeing new cards from Core Set 2019! Two of the most promising are the Militia Bugler and Planeswalker Vivien Reid. Militia Bugler is a source of card advantage that is somewhat restrictive on your deck design. Mike puts Militia Bugler on "Gonti for yourself" ... He's not wrong. Not that wrong anyway. Like Gonti, Lord of Luxury, Militia Bugler is a 2/3 creature with an ability once it hits the battlefield. In Gonti's case it is Deathtouch and in the Bugler's case Vigilance. Both of them generate card advantage by looking at the top of someone's library; theirs in Gonti's case, your own in the Bugler's. 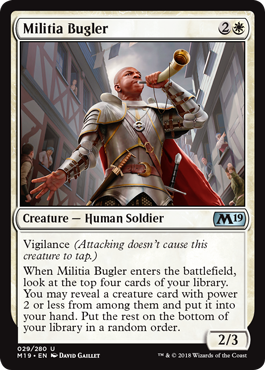 Militia Bugler has the benefit of costing three mana rather than four; but comes with a meaningful deck design price: If you're going to get paid off by Militia Bugler, you will have to have a certain number of [other] creatures with a maximum of two printed power. If you've built your deck appropriately, Militia Bugler plays in the range of Sea Gate Oracle or Court Hussar -- both contributing creatures in their respective Standard formats. 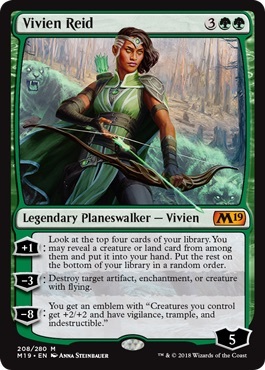 Is Vivien Reid "the green Teferi"? Vivien Reid will be a key Role Player in Standard, if not quite "the Green Teferi". "I'm not in it for the emblem." "Even when it lines up right, it's worse than Teferi every step of the way." 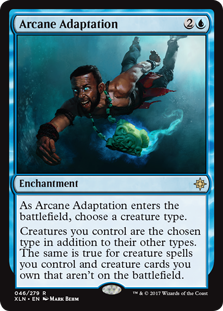 Mike's initial love for this card comes from its very obvious superiority over the already-played Crushing Canopy. Sure, Vivien Reid costs two more mana than Crushing Canopy, but the [-3] ability is wildly better! Not only can you potentially keep a draw-engine planeswalker, you gain the ability to destroy artifacts. Coming back to the card advantage ability, Patrick points out the [+1] is quite a bit better than just drawing a card. You can Impulse for a land if you need it, and otherwise, you're probably digging for Brontodon, Chupacabra, or The Scarab God. "Don't let the Top 8 fool you... [Pro Tour Dominaria] was actually far more dominated by R/B and Mono-Red than it looks." According to this article by Mike, the record for creatures (or for that matter enchantments) in a Top 8 is 28. So Goblin Chainwhirler ties the ceiling held by Sylvan Caryatid and Courser of Kruphix. So here's the thing... Goblin Chainwhirler is often accompanied by Bomat Courier. In this Top 8 five of the seven Red Decks played both 1:1. The winning Red Aggro, though, ran only three copies of Bomat Courier. Finally, one more mid-range black-red take played zero. 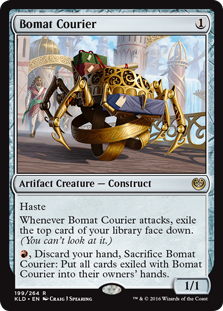 Bomat Courier is a good card... It just has one toughness. In past red mirror matches, the little Construct represented an important source of long-term card advantage. 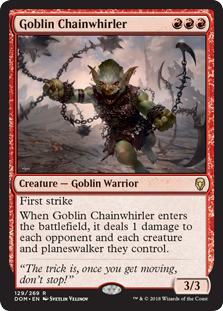 However in a world ruled by Goblin Chainwhirler, it is just a one toughness creature that is out-classed by every other playable card in black-red or mono-red. Let me see if I've got this right: It's not just that Bomat Courier is one toughness... It's that it's one toughness and generally weak. While Llanowar Elves is also one toughness (ergo Goblin chow) gambling with it might pay off because it's so gosh darn powerful. You've got it! Fast Llanowar Elves draws can lead to your best stuff, like a turn-two Dinosaur to hold the fort, or the jump to a Ravenous Chupacabra or Hour of Promise to put you ahead of the Red Deck. Here's a different question... If so many people are going to be Red Decks, and I should side out Bomat Courier... Should I play it at all? So... Should You Play Bomat Courier? In regular Standard... The clay isn't dry yet. Will more than 50% of your opponents be Red Aggro? Will 7/8? Or even more lopsided, as Patrick described? If you face an overwhelming number of Red Aggro opponents, it might make sense to eschew the card, or play it in the sideboard, as was done in a recent Grand Prix Top 4. In the realm of "straight" U/W, Brad Nelson dialed it back to win with two copies of Approach of the Second Sun!